I’m so glad you're here. I'm Laura Capp, and mine is the hand writing this little place, Postscript, into being. 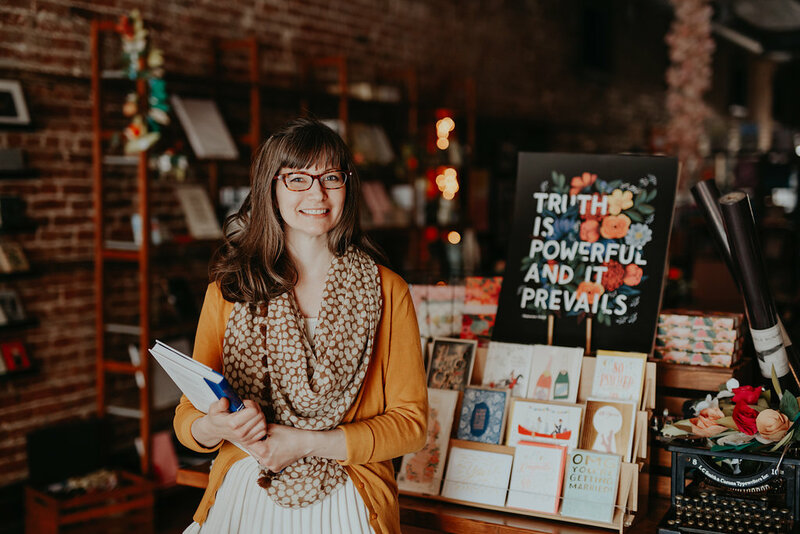 Nestled along the brick main street in the small town of Ashland, Nebraska, Postscript is a boutique for paper, book, and lettering arts that brings a modern sensibility to antiquated processes. 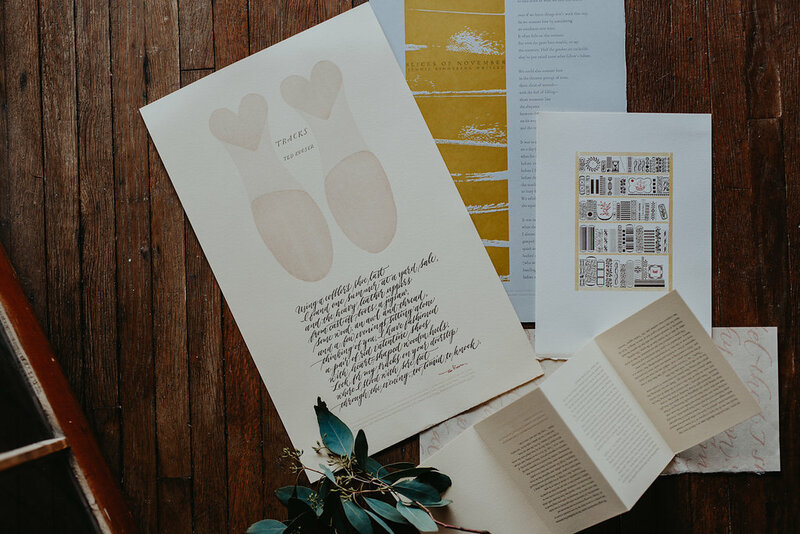 Focusing on high-quality craftsmanship and the handmade, Postscript carries everything you need for the art of writing, from letterpress printed cards and stationery sets to fountain pens and calligraphy supplies to luxurious finishing touches like vintage stamps, seals, and sealing wax. We also carry children's books that will make your heart soar, hardcover classics that are as arresting to behold as they are to read, and tools to construct your own handbound books. Postscript also offers a studio space in the back where we host workshops in calligraphy, bookbinding, paper crafts, watercolor, sign painting, and related pursuits taught by highly qualified instructors. The back workshop space doubles, on the average day, as my personal studio, where I work as a book artist under the imprint of Pentameter Press Studio. Pentameter Press Studio is a circuitous outgrowth of my two passions -- literature and lettering. The focus of my artistic output is, in a line of pentameter, "poetry in penmanship and printing." I mean this, like any English major worth her salt, both literally and figuratively. My calligraphy and my printing almost always take as their textual foundation poems. Often Victorian poems (I suffer from Anglophilia) and just as routinely poems by women writers. But I am in love with poetry of all kinds and believe that poets as a group should be listened to, quoted, and revered far more than they tend to be. This is a belief I attempt to proselytize by framing heart-stopping language within a visual poetry of my own — a space where letterforms become not solely a means to meaning but an aesthetic end in and of themselves. Where word becomes image, writer becomes artist, and reader becomes viewer. When self-directed, I work on an ongoing project called "Poetry by Post," but I am also for hire for custom calligraphy, bookbinding, and printing needs. Let's set up an appointment if you are in search of a calligrapher, binder, or printer and would like to get a sense of my style, but if credentials are useful, mine paint me for what I am: a bona fide school nerd. I spent over a decade studying both literature and lettering at the University of Iowa, where I received a Ph.D. in English and an MFA in Book Arts. Prior to that, I earned a B.A. in English from Creighton University. My tandem loves of literature and lettering do have competition. I am also a mother to three other loves: Eliza, Hazel, and Phoebe. Although I am trying not to foist my interests upon them, they adore books and seem excited by calligraphy, and I am admittedly thrilled. P.S. P.S. is, of course, the abbreviation for postscript, that tacked-on something-or-other that periodically found its way into the bottoms of letters when people still regularly wrote them and couldn’t simply move a cursor to add information where it might more naturally go. As a writer who has trouble signing off, the postscript is a familiar space for me. I appreciate, too, its current resonance of living in a post-script world. Too many children are losing a connection between hand and mind, and I want to do my part to preserve the distinctly human benefits and idiosyncrasies of writing by hand.